I am starting to get more mobility in my right arm following my surgery, so hopefully I'll be able to post more regularly. I do have a slight problem in that I can't really stamp right now, so I'll have to find things in my stamp room that I've already created to share with you for awhile. Today's share though, is part of a recent creation. 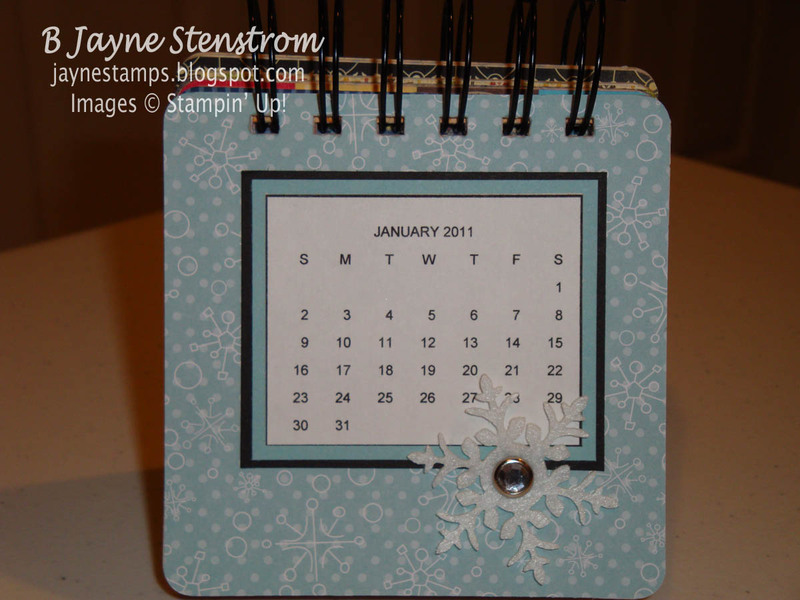 Some of my Chalk-a-holic buddies and I got together just before my surgery in December and made these desktop coaster calendars. It was so much fun! The original idea came from Carol Stofer - she had one very similar to this at the last Tickled Ink meeting I attended, so we started with her basic idea and created our own. Most of the Designer Series Paper I used is current, but a few things used are retired Stampin' Up! things. But hey, if I've got it, I may as well use it, right? January's paper was from the Candy Cane Christmas DSP pack. The snowflake is something that SU! had in a mini catalog about a year or so ago , and it's accented with a clear rhinestone brad for a little extra bling. 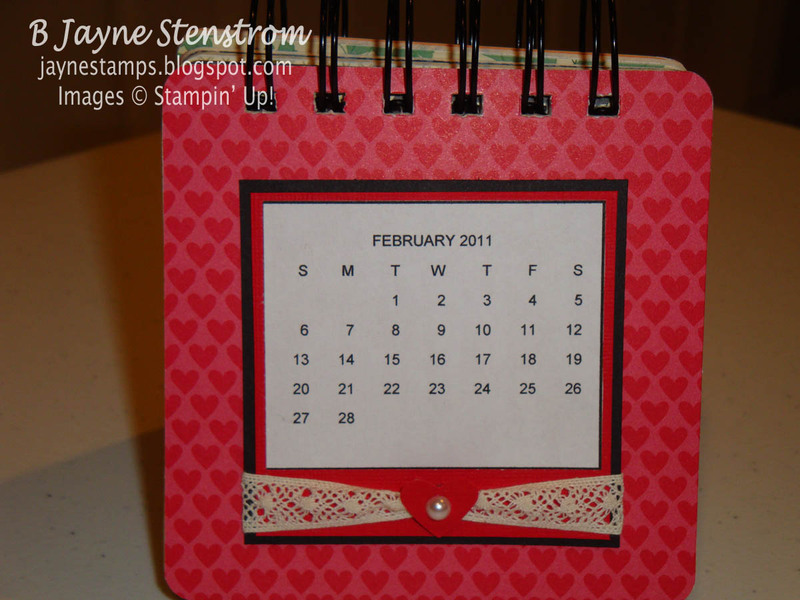 The February coaster uses paper from the Play Date DSP. Don't you just love those little hearts? It's accented with some Chantilly Crochet Trim, a small punched red heart, and a pearl from the Basic Pearls. March is done with Peach Parfait DSP from the In Color DSP Stack (pg. 175 IB&C). 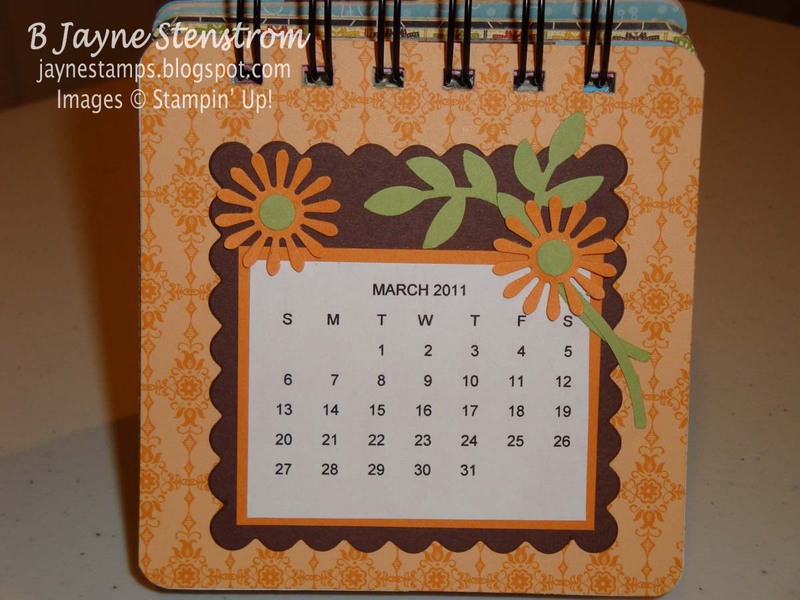 The Chocolate Chip cardstock is cut with the Scallop Squares duo die - I just love that die! The leaves are from the Two-Step Bird punch. 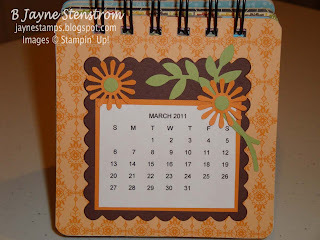 The flowers are punched from a retired Stampin' Up! punch, but you could use any type of flower for an accent. I will be back tomorrow with more pages for this calendar. Thank you for sharing your calendar with all of us. 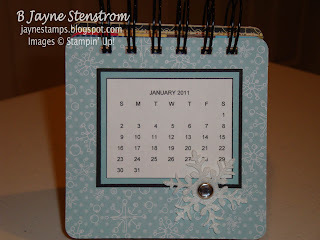 I found you while doing a calendar search and I absolutely love your beautiful calendar! !